We are gathered today around the altar of the Lord to commemorate the centenary of the birth of Blessed Oscar Arnulfo Romero. Today, all of us here, together with others in El Salvador and in other parts of the world, remember this shepherd for his Gospel witness that brings light to believers and non-believers alike. On that long ago August 15, 1917, God chose the child born that day for a great mission: to prepare the hearts of his fellow countrymen to welcome the Gospel of his Son. As often happens with prophets, Romero paid with life. His birth, his life, and especially his death were all focused on Jesus. He made his own the words that Paul wrote to the Romans: “What will separate us from the love of Christ? Will anguish, or distress, or persecution, or famine, or nakedness, or peril, or the sword?…For I am convinced that neither neither death, nor life … nor other creature will be able to separate us from the love of God…. ” (Rm 8:35, 39). The last years of his pastoral life were guided by those exact words. 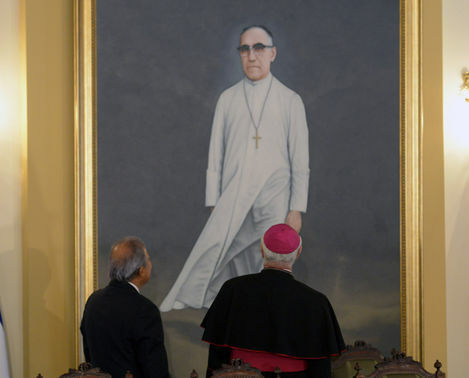 Pope Francis has made it clear that Romero was persecuted even after his death with the opposition to his beatification that many persons mounted. But when May 25 last year finally came, more than sixty thousand people gathered around the altar to thank the Lord for sending this shepherd. And I’ll never forget the emotion of that day. At his tomb, many, just as when he was alive, spoke to him because they felt he was still with them! Today, on the centenary of his birth, we remember him yet. And we do so beginning with the day he entered Heaven. It was on March 24, 1980, that he was assassinated at the altar just after his homily nd while he was preparing the gifts at the Offertory. They silenced him with a single shot to the heart, but now he speaks to us even more clearly. His death is written in the heart of the Twentieth Century Church. In ages past, only two other bishops met the same fate: St. Stanislaus, Bishop of Kraków, and St. Thomas à Becket, Archbishop of Canterbury. I myself remember the emotion of St. John Paul II when he heard that Romero had been assassinated. And when, at the Celebration for New Martyrs during the Great Jubilee of the Year Two Thousand, he saw that Romero’s name had been left out—that’s how strong Curia opposition was—the Pope added it, writing that Romero was an example of the Shepherd who lays down his life for his flock. And today, Romero’s death continues to speak to us in the martyrdoms of the many priests in the Middle East who have been assassinated while celebrating Sunday Mass. Romero was the first in this long line heros who died for Christ in the Twentieth Century, in the New Millennium. And with him, let us remember all the Christians who continue to bear witness to the Gospel even unto the shedding of their blood. The Martyr’s death that Romero suffered is his most precious gift to us. That gift is especially precious in our days, and the people know it. That’s why his testimony continues to be welcomed all over the world. Yes, dear sisters and dear brothers, in a world where self-love and self preservation are supreme values, where we protect ourselves from others by raising building walls and barriers both in our hearts and in our relationships, Romero’s example is a shining beacon, a light that delivers individuals and peoples from the darkness of egoism. Romero is speaking to us, and I can hear the echo of his last Sunday homily: “In the name of God, and in the name of this suffering people, I beg you, I beseech you; I order you in the name of God—stop the repression.” There is too much violence in the world, there is so much violence in El Salvador, where gangs continue to bloody the country. There is violence in too many countries in the world; too many wars; Hunger is too widespread and there is too much injustice to number. Ours is a world of indifference that lets evil reap its harvest of innocent souls, young and old.. There is too much terrorist violence that sows death and fear. Today, Romero asks the whole world to stop the violence, stop the killing. Romero believed in the missionary power of the Council. In a homily at the funeral of a priest killed by death squads, he said that Vatican Council II calls on all Christians today to be martyrs, that is, to give their lives to Jesus and the poor. “Some, he said, the Lord asks to shed their blood, as He did to this priest, but he asks all to give their life for others, to be martyrs.” He gave another example, that of a mother who conceives a child, carries it in her womb, gives it birth, nourishes it, cares for it. Romero said, “This mother is a martyr because she is giving her life for her child..” Dear sisters and dear brothers, martyrdom—giving one’s life—is the only way to follow the Gospel in our time. We can not be disciples who act only out of habit and are thinking only of ourselves. That is not Gospel joy. Romero reminds us of the teaching of Jesus that was quoted by the Apostle Paul: “There is more joy in giving than in receiving” (Acts 20:35). Indeed, martyrdom, giving one’s life for others, is the only way to follow Jesus and the only way to be truly blessed.